Have you heard about this book that's about to be released? I was so excited about it that I sent a hopeful plea to Stash books and asked for a copy of Modern Quilting Designs to review on the blog and the answer was yes, with one to giveaway too! I'm so thrilled for this book by Bethany Pease because there's really nothing like it right now on book shelves. It seems like there are a few books dedicated to continuous line pictorial designs (i.e. dolphins, cowboy boots) and some that show geometric patterns for blocks or borders, but not much in the abstract, all-over, continuous line category. Modern Quilting Designs is filling that gap! The book is pretty much just sharpie-on-paper drawings of quilting designs. There is not much text, so you can simply flip through the book and take in the designs. I learn visually, so I like that. Most of the quilting ideas seemed like things I could use in my quilts, although there was a section of flowery block-based designs that didn't seem like designs I would use. I was also surprised to see some designs that were not continuous-line. These don't make up the bulk of the book, though. The best part of this library of designs, and what this author seems to excel in, are all the "mash ups" she creates: inventive, organic combinations of basic patterns. Think feathers plus spirals, or wavy lines plus pebbles plus scallops, or flamboyant vines full of variety. This is good for me because I tend to get stuck in one mindset - quilting something completely in spirals, or making all my leaves on a vine exactly the same, for instance. Now, one downside to the book is that there is no explanation of how to go about stitching the designs. Feather first and then the wavy lines around it? Wavy lines first then fit the feather inside? For this reason, I'd say the book will be best for someone who has started to improvise with their quilting already. You'll need to come up with your own approach to creating the more complex designs you see. I thought a thorough review of a book would include "trying it out", so I decided to stitch a design and see how it went. I decided on the captivating design featured on the cover. It was fun and the results were great! I used the stitched piece as the outside of the sewing caddy. I'm happy to have this book by my side, and happy to have one to send on to a reader! If you'd like to include your name in the random drawing, leave a comment on this post (and make sure I can contact you if you win!). 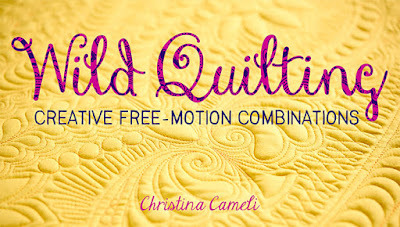 In your comment tell me...what is something simple you could do to improve your free motion quilting? I'll draw the winner Wednesday. It looks like a really fun book to play around with! Pure and simple--I need to practice more. Thanks for the chance to win! 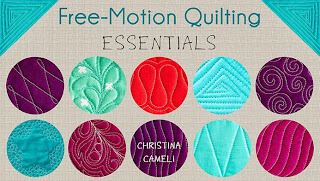 My free motion quilting would improve with practice. Simple. Looks like lots of fun = and I love your test design!!! Practice, practice, practice! As already said - simple. there are always the three Ps, and if I keep trying out new designs, they will get better. Oh, and I need to "learn" how to doodle! more practice - more patience - more breathing. Your "test" is beautiful! The book looks great. The best thing I could do is PRACTICE. This book would help! This book looks like something I would really enjoy. I am just getting past wiggles and stippling and love contemporary all over designs. Your work is great. I have taken several free motion classes and as the instructors always say, you HAVE to just sit down and Do It! Make up quilt sandwiches and go after it. One blogger I read says she always uses a pen and paper first to get the design in her brain. That seems like a good idea! slow down...I always try to go to fast and get eyelashes everywhere. Hmmm - improvement? Planning! I free motion and get wrapped up in my own little world of scrunchie continuous lines.....there is little advance planning. SO I have to say an overall plan would be a good place to start. Thanks for the giveaway! This book looks great! I want to try something more modern for a wedding quilt I made this fall. I plan to start drawing on a dry erase board this year to improve my quilting, a little each day is supposed to help "muscle memory". I need to slow down on the curves and relax my shoulders, I always seem to have the up by my ears :) Thanks for the chance to win. About time! Great review, gonna pick it up when its released. ..forgot to add, use quilting gloves! Oh wow! That is one great looking book! I need to slow down on curves too...and give myself more opportunities to just quilt! What a neat book. I'm always looking for new inspiration for quilting. I think I'm going to have to buy this one. Oh, my!! I would love to win this book! Thank you so much for this generous givaway! 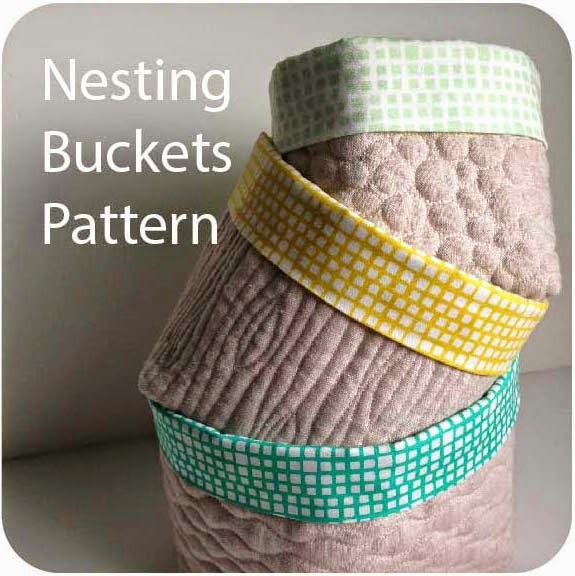 I love being able to browse ideas for quilting... sometimes your mind just goes BLANK, right? So good to be able to see examples of different styles! I could use some new designs!! I still struggle with speed sometimes. The quilting is much smoother when I go fairly fast, but then I get stuck as to where to go next! I'm really curious to look at this book - your sample is AMAZING!! so i saw your post with the sewing caddy, and then saw the cover of the book somewhere and I was like, "Haaayyyy! that girl stole Christina's quilt pattern!" looks like a great book. just started playing around more with fmq on my last project, i tried flowers.. but i need to keep trying.. you're right, where to start/stop is a personal preference that must be learned by trial and error.. Your sample looks great. I have meandering down to an art form; looks like this book would be great inspiration to help me break out of my rut. This is probably the only book I "need". I have plenty of idea and pattern books, but it's so hard to come up with new and exciting ways to quilt! I think the last 5 quilts I've made have had swirls on them-- great, but I'd like to do something new! I have gotten meandering down and have been a little nervous to try something else! This book may be just what I need. I would like to expand the designs in my "library". Mashing up multiple designs looks like a great way to improve my FMQ. Something simple would be to, uh, actually do some! I need to practice more, so I've joined Sew Cal's 2012 challenge and am going to take a FMQ class at my local quilt store. I hope to at least get the basics down in a few months. Interesting book! I got this book for Christmas and have really enjoyed looking at it - now to put some of it into practice!! this book looks like eye candy to me! i want it! pick me pick me! I'M GETTING SOME BETTER AT FM! Looks like a wonderful reference book! I am trying to get beyond stippling and would love this! My goodness - I never thought of contacting the publisher and asking if I could review a book. Good for you! I could definitely practice more and that would probably improve my skills. I think I would improve if I would just practice more. I just finished a lap quilt, and by the time I got near the end, I had found my rhythm and my quilting was respectable. But I'm done with the quilt now. Something simple - Practice, be creative, reach outside the comfort zone. I think this book looks amazing!!! I would like to improve my variety of designs, that is why I jioned the FMQ Challenge with SewCalGal!!! Love the chance to win this Book! Happy Quilting Liz in New Zealand. That book has definitely caught my interest! My free motion could really improve just by my ability to improvise...I am such a by the book gal, sometimes that can be a pain! I would love to have this book and probably will but would love to win it. Practice is the best thing for improving. I took my stash and made a big block quick just to practice feathers. They are getting better! The old saw "Practice, practice, practice" has got to be the ticket! And I need it! I want to improve the fluidity of my FMQ and I know I need to play with it -- a lot! -- to accomplish that goal. I'd love to win this book! Need to improve my ability to "see" ahead of the design to know where to head after completing a motif. Sketching the design ahead of quilting it doesn't seem to have helped me much. Continuous practice time every day is also a goal! Thanks for the chance to win what looks to be a lovely book! I am practicing, practicing, practicing- on a white board, with a pencil and with my machine and different threads. I can already see the difference in just days. Now if I can just make myself stick to it! Sounds like a great book! Something simple I could do to improve is practice!! My machine quilting doesn't stray far from the basic stipple or lazy rope. This would help me get out of that rutt. I really love your "practice piece." Your caddy looks beautiful. Oh my goodness - I saw this at my quilt shop this week. And I almost bought it. In fact, I was planning to go back for it next chance. I need to desperately add some designs to my quilt motif ideas. This book looks like just the thing. Fresh and new. This book has been on my wish list for a while. Besides practice, I like learning though others. The free motion project and the free motion challenge have been great so far. I'm hyperventilating over the chance to win this book! I know I need to slow down on the curves, and get out of rut of meandering only! Thanks for all the encouraging new ideas! Not much text and plenty of designs? So my kind of book. I think the best thing for me is to play and let loose with the designs. since I am a visual learner this BOOK would be perfect for me to use for inspiration and hopefully reach my goal this year. I need to learn how to relax and keep my stitches an even size. The one thing I need to do at the moment to improve my free-motion quilting is to clear my sewing room! I've been unable to quilt much for the last year because life got in the way - and during that time my sewing machines have been somewhat buried... I have been finding that I often just don't know how to quilt simple modern quilts. I have some designs that I've used but they are often not right for the modern tops I've been making. The book looks like it has some great suggestions! The book looks like it has lots of ideas for designs that would never occur to me in "real life"! Truly, the best thing I can think of to improve my freemotion quilting is the same thing that many others have said...practice! Another thing would be to clear off the entire top of my sewing table and the table behind it. It seems that whenever I freemotion anything of decent size, I end up shoving bits of effluvia off the tables and onto the floor. Might make more sense to start with the area clear! Thanks for thw chance of winning a book that looks really useful!I have a number of FMQ books and still seem to return to the trusted stippling... i need 3ps to improve - planning, patience and practice! I to am a visual person... Would love the book .. do we have a release date? I am always looking at patterns everywhere I go and this book seems like a great TOOL to have. I need to just relax and practice more! Oh that looks like a really fun book! I could use that - look like fun! Thanks for reviewing the book for us. It looks like a great addition to my little library. I need to doodle more on paper and my white board. I think the practice will be a big help for my fmq. i could try variations on stippling....!! that's all i've done! The simple thing I could do is not that easy. I need a table with an insert for my sewing machine and lots of space behind it. In other words, I need a big sewing surface to reduce drag. thanks for the chance to win the book. Looks nice! I'd love to add this book to my collection. It's great to be able to pull one out with photos and just leaf thru to see what design appeals. Looks like a good book for quick ideas. Thanks for the review. The combination quilting looks like a simple way to do a overall quilting design without having to keep it consistance through out the entire quilt. Praticing with a purpose. This sounds great! I need the inspiration and as much as I like pinterest and blogs, in some cases there is nothing better than flipping pages in a book. I could improve my FMQ with two steps: winding loads of bobbins at the start (so I don't lose momentum when one runs out) and with more dedicated time to practice. Thanks for the review and giveaway. For me, it's planning ahead. It helps me to see other ideas! Thanks for sharing this book! I would love, love, love to try this one out! Thanks for the review....and honest comments about it. Practice and work more with thread tensions. The simple thing would be to practice more - I tend to get wrapped up in piecing and only start free-motion quilting when I need to get something quilted. This looks like an interesting book that I'd like to have. Would SO love to practice more!! Wow - this book looks amazing! It's all about practice, and not being too anxious about getting perfect results. Perfect for my goal to improve my FMQ this year! Thanks. I need to coordinate my pedal speed with my hand speed. Still working on that! well for starters i could probably try to practice more! i was thinking about doing a QAYG with smaller blocks that i could join together for a quilt at the end. 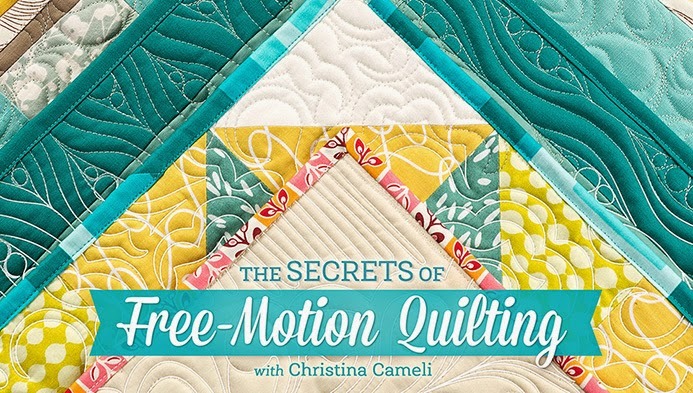 I'd say that the one thing I need to do to improve my free motion quilting is to do it! teehee. I would LOVE a copy of that book!I heard her interview on Creative Mojo with Mark Lipinski. I really need to find some good quality thread that doesn't break all the time. Try new designs. I can stipple and swirl but I'm scared to do anything else. I would love a book like that, I get in a rut and have a difficult time coming up with ideas that aren't one of my predictable 3! Time for some new ideas!! what a genius idea for a book! 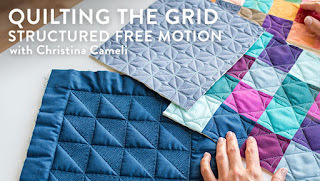 I need to trying different patterns with my free motion quilting. Meandering, I can do. Spirals, I can do. So I rarely stretch my wings and try anything else. I would like to be better at visualizing a design and not feel constrained by the elements of the block, meaning, I want the freedom to cross those lines. The simple thing I could do, is practise! I do not do enough of that! I would simply adore this book :-) I love your sample. Practice of course! I'm also saving to buy a machine with a longer neck because my little Brother has a short one which makes doing anything other than piecing hard with my big hands. i would love to win any book that would help my fmq. the simplest things i could do to improve my skills is to adjust the table height and practice more. Practice, practice, and more practice would definitely help me improve. I would love this book!! Begin FMQ - This is the year I want to learn to FMQ. This would be my first book on the subject should I be so fortunate as to win. Thanks for the chance. I think finding my own style of quilting and then going with it- not trying to mimic other's work that I admire. 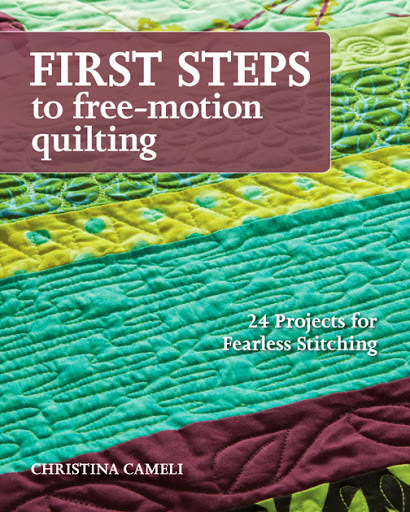 I would love to develop the confidence to "draw" figures in my free motion quilting. The book looks very interesting. Practice, practice, practice...I've only had my Vision for 4 months!!! Practice. I have the basic understanding and do sort of ok when I do it but I really need to practice more. Gosh this book looks inspirational.....Im learning as I go and need all the help I can find! Thanks for mentioning it and heres hoping! Looks like a great book! Maybe it would give me the guts to actually *try* free motion. look s good ... im in ..
Hello Christina! This is Bethany Pease. I am so glad you enjoyed my book. Great job on your first try at the cover design. You rocked it! As far as the flower medallions go in the back of the book. Those are awesome for stitching "unexpectedly" in corners of borders, blank centers of traditional or plain modern quilt blocks. I used several of them all-together in a kaleidoscope quilt. The fabrics in the quilt had a very organic feel. So when I stitched the various, yet coordinating, medallions all over the top in each block it mimiced the organic designs already in the quilt in a lacy type overlay of stitching. Go to my blog & check out Vicki's Water garden quilt. (Just scroll down). It should be the last post. Thanks for promoting my book! This looks like a super book. Just the kind I have been looking for to gather ideas for the quilts I enjoy doing. I look forward to seeing it in person. A simple thing to do to help us get better at free motion stitching is to doodle a LOT! Draw on kid's sketching toys, draw programs on your computer or iPad, use a dry erase board or even on junk mail. The more comfortable you get before you start, the easier it will be to stitch. The book looks fantastic - I hope I win!!! 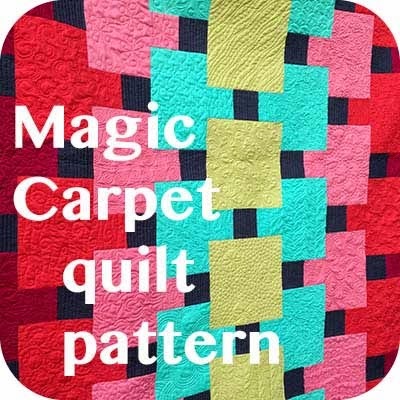 Improving FMQ is super easy. Practice. Practice. Practice. I would love to win this book and try out some of these designs. I'd love to win the book. One thing I could do to improve my machine quilting is to quit being such a weenie and actually try it! I'm completely terrified!